Sewing in the beginning was used to stitch together animal hides for clothing and for shelter. 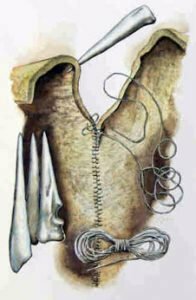 For example, they used sinew for thread and needles made of bone. We are happy to say that we have grown past this and moved onto amazing ways of sewing. Come learn a new and modern way for the next quilt blocks.